How can Employers Benefit from Job Fairs? You are here: Home / For Employers / How can Employers Benefit from Job Fairs? 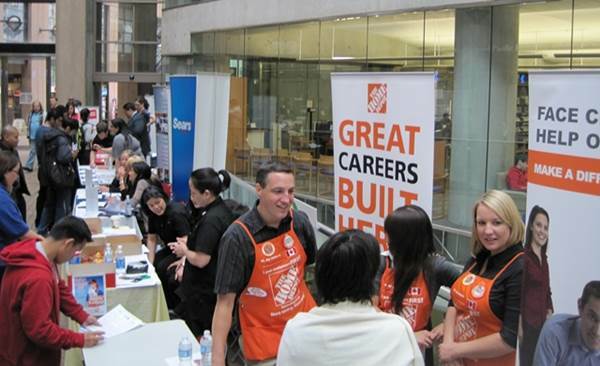 Above: The Home Depot stall at a Job Fair in Vancouver, Canada – these big and popular companies draw the job seeking crowds in, and your small company will also find increased visitors because of that. Few employers are struggling to find employees at the moment with so many job seekers but with such a saturated market, it can be difficult to sort through such a wide variety of applicants. One tool that more small companies should be utilizing is a Job Fair. You may think that at times like this when finding applicants is relatively easy, the expenditure of visiting Jobs Fairs is unjustified; however for smaller companies it is now more than ever that you can find value at these fairs. With so few jobs available, job seekers are greatly widening there net and applying to jobs that donâ€™t really suit their backgrounds. Job Fairs allow you to target your potential applicants a lot more specifically as different Job Fairs are open to different groups of people. Most Universities hold several Job Fairs every year allowing you to target applicants not only by education level but often also applicants from particular fields of study.Â You will therefore only be talking to applicants that have the skills you require. When you are receiving a large number of applications, it can be hard to give them all the attention they need, particularly if you are a smaller company. It can therefore be all too easy to mistakenly pass up good candidates because of simple flaws in their applications. Job Fairs allow you to quickly conduct miniature informal interviews with any potential applicants that are often much more effective for deciding if a candidate would be a good fit for your company than traditional application processes. Many Job Fairs have 1000s of attendees and you can easily talk to hundreds in one day, meaning you get to know a lot more candidates a lot quicker. The strong ones will stick in your mind. Although the fees for attending Job Fairs can be quite high, they are actually fairly good value; Job Fairs are well advertised to a well targeted audience. If you are attending a Job Fair, you can often then reduce your own recruitment budget. Many University Job Fairs will also include a link to your company website on their own site which can be great for your websites SEO. Your staff members attending the fairs also get an opportunity to see whatâ€™s going on at other companies; information you can use to improve your own environment. If you are a smaller company, it can feel like you are at a disadvantage at a Job Fair; you will often be competing alongside much bigger companies that job seekers will already be thinking of working for. However, this can actually work to your advantage; these big employers are drawing the traffic to the fair, but you have as much access to this traffic to broadcast your message too. Job seekers, however, will be unlikely to talk with you if itâ€™s not obvious who you are and what you do. It is therefore very important for you to create a booth and banner that put out not only your company name, but also what it is you do and what you can offer employees.Â This banner stand is what will attract job seekers, so make sure itâ€™s good. There are a number of specialist companies like Marler Haley who have expertise in helping small businesses with this. You can check out their portable banner stands here. Some companies will also try and attract people to their stand by handing out freebies. If your budget stretches to this, it can be an effective strategy, but try and make sure any gift you distribute is linked to your industry so that people coming to get it are actually potential employees and not just someone after a freebie. When you do give out freebies (and even if you donâ€™t), try and bundle it with more information about working for your company. Many job seekers suffer from information overload at a Job Fair, so your pitch can easily slip to the back of their mind by the end of the day and if youâ€™ve given them all the details written down, it will be easy for them to follow it up later. It is also very important that you are selective about which fairs you attend; if your budget only stretches to a small number of fairs, then pick the ones that are most likely to have the applicants you are looking for. This not only gets you the best value for your investment, but sometimes very niche fairs will give discounts to employers who fit them well. 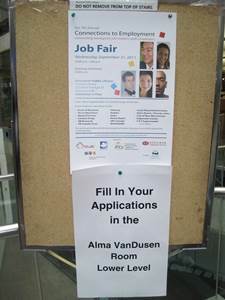 If you think that attending a University Job Fair could be a good decision for your company, call the Career Centers at your local universities where there will almost certainly be someone happy to give you all the details of their upcoming Job Fairs and what specifically they can offer you.